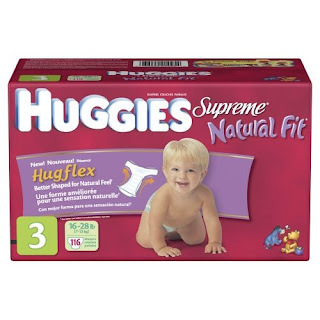 Huggies are a great deal right now at Amazon! You can get a big box, plus sign up for their "subscriber" service and save another 20%! That drops the per diaper price down to just over 21 cents a diaper for the Size 3 diapers. This is the best deal I could currently find -- especially since there is no shipping charge! I was happy to get diapers for 23 cents each locally, but it's even better to save more and have them delivered to my door. The 20% savings is only good until the end of the month. After that, their regular savings kicks in again for 15% off regular prices when you sign up for their subscriber services. I haven't done it yet, but I understand it's super simple to adjust, change or cancel once you sign up for that service.